SofTopper Truck Caps are built to last, easy to use and works with most pickups. 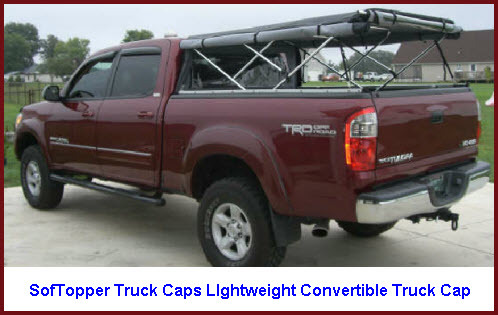 SofTopper Truck Caps are a most unusual and welcome entry in the truck cap marketplace. The concept of a lightweight convertible truck cap was made a reality in 2000 with the formation of SofTopper. The company started out making a single model of truck topper to fit compact pickups and now offers 24+ models that fit 85%+ of all pickups on the market today. What makes SofTopper Truck Caps different? Most truck toppers use a rigid shell made of fiberglass, steel or aluminum. But the folks at SofTopper use an automotive grade coated convertible fabric draped over high strength aluminum folding frames and bedrails to give you a retractable truck topper that closely resembles the top on a convertible style automobile. While these lightweight soft truck toppers don't give you Fort Knox like security or let you run with 250 lbs of gear on your roof racks they do give you lightweight product with a quick install that you can use for camping and normal recreational activities. You can protect your cargo from sun, rain and snow and in a few seconds you can retract the topper and have full use of your truck bed. Note: You must have an RSS Reader installed and configured before clicking on the Orange RSS Button. An RSS Reader allows automatic download of changes/updates made to this website without having to visit this page. Saves time, effort and keeps you up to date. Copyright © 2008 - 2017 by Systems Consulting Inc.